The DROIDS line consisted of 12 action figures and three vehicles, the ATL Interceptor, Side Gunner, and A-Wing. 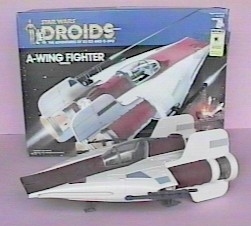 While most DROIDS merchandise has experienced only mediocre popularity among collectors, the A-Wing has become one of the most sought after toys from Kenner's original Star Wars line. 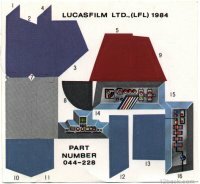 Although prototype Power of the Force boxes have surfaced, the ship was only available in DROIDS packaging. Pictures on the box were apparently intended for the POF packaging -- they show late ROJ and POF figures instead of those from the DROIDS line. 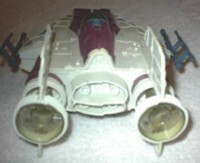 When this ship was introduced in 1985, the sale of Star Wars merchandise was in decline. 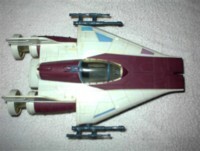 As a result, not many A-Wings were bought when compared to other ships. 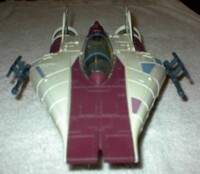 This rarity translates into value -- the A-Wing is one of the most expensive Star Wars vehicle on the market today. "Note: To reset landing gear pod if it fails to retract or remains out of line, pull landing gear pod to the rear of vehicle. It will then reset properly. Only rear landing gear pods can be reset." Landing gear extends/ retracts by remote button. To lower gear, press button in and slide forward. Canopy opens/ closes remotely by sliding button located behind canopy. Laser cannons rotate through 360 degrees.